Tina Fey and I would get into trouble if we were friends. I admire a woman who speaks her mind, isn’t afraid to stand up for herself and others, is smart, swims against the current of societal expectation and is known to be a bit mouthy and bossy now and again. This might have something to do with the fact that I have been known to be rather mouthy and a bit feisty when fighting for someone or something I believe in. 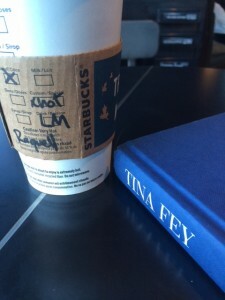 Reading Tina’s book, Bossypants, made me laugh out loud in a Starbucks which scared the other coffee drinking people; I couldn’t help it, she’s hilarious. I giggled at her irreverence towards things that most women get stuck on (see: photoshop and magazine covers, women over the age of 70, page 157) and I found myself nodding my head in agreement towards her approach to and perspective on life. It always makes me laugh when they misspell my fake name at coffee shops. Have we stopped teaching children how to spell and are relying solely on iPhone autocorrect? Oh help! On being a feminist. Sigh. She, like me, is a feminist but the strange breed of feminist that gets annoyed being labeled a feminist because most of the times the conversation is tiresome, predictable and slaps labels on you which are unhelpful and surprisingly sticky. I dislike applying the term ‘feminist‘ to myself simply due to the baggage the society has tied to it over the decades. As per usual, society takes the most salacious and ridiculous examples they can find and affixes them to terms with superglue. The core of feminism is not trying to make women better than men; simply put, it is a demand for equal rights, access, opportunities and treatment. On the flip side, I am also a ‘masculinist‘, I think men should have equal rights, access, opportunities and treatment as women. I need to start a new movement –> the ‘Peopleist’ movement. I am envisioning Peopleist shirts, flyers, hashtags and perhaps even a picket line complete with tagboard signs and angry chanting … both bras and jock straps would be burned in a massive pile on the steps of an important government building. Being a woman living and working in a man’s world for nearly two decades, aka usually being the only woman in the room, I have come to accept and overlook things which my radical feminist friends would be outraged about. In my experience, taking the feminist platform gets frustrating and actually makes it harder to be a feminist that gets stuff done for all women everywhere. Most of the time the larger conversations you want to have in life don’t require words; attitude, discipline, action and perseverance are the things which create lasting change and clearly state your stance. People experience and remember what you do, how you make them feel and who you are – not what you say. Always trust what people do, not what they say. Decide what you want, say yes and go after it, even when the societal rules tell you it shouldn’t / can’t be done – create some permanent wins. What’s a permanent win, you ask? The things in life that no one, no matter what they do, can take away from you are permanent wins; also known as being your own unique brand of amazing. When looking back on life, these accomplishments make it on your highlight reel and cause you grin like an idiot. And I will continue to do as Tina suggests, aim to look good while being an odd brand of feminist because it justifies my fabulous shoe collection. It’s not vanity, because if you look weird, it will distract from what you’re trying to do. If you look as good as you can, people will be able to pay attention to what you’re actually saying. The challenge of life is to figure out what permanent wins you want to have to your credit and then go after them with everything you’ve got while not caring what people think. 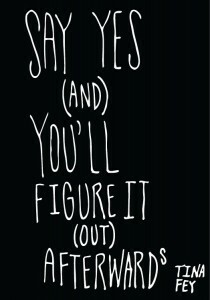 Sounds easy, but its not – especially the ‘what people think‘ part – even when you’re my age. What permanent wins are you going after? What kind of Bossypants are you going to become? It seems to me that you were “Pam” the day we met at Starbucks. Hard to mess that one up, unless, of course, you’re dyslexic and accidentally spell it “Map” which would really be quite appropriate since your writing so often provides a map for those of us who follow you! This post is no exception. I am definitely your kind of feminist and would love to join your peopleist movement!